One of the extra benefits in my life of competing and this blog is that my network of like-minded athletes, friends and supporters continues to grow. One clear example is my burgeoning relationship with RxNetworking.com, a social media platform designed for CrossFit enthusiasts to meet and connect. The founders have been showcasing some of my interviews on their blog. This all led to me being introduced to Blonyx, a supplement company based out of Vancouver, Canada that sells clean, Paleo-friendly products. They asked me if I wanted to do a month-long “test” of their HMB+ Creatine product. I was hesitant at first because creatine always sounded off-limits to the amateur athlete like myself. In a Men’s Fitness article on the topic, it states, “In the professional world, reports found that 25 percent of pro baseball players and up to 50 percent of footballers use creatine supplement.” It seemed out of my league. But in a conversation with the owners of the company, given my training mix of CrossFit and weight-lifting, I was a perfect candidate. According to Blonyx, their HMB+ Creatine is “proven to increase strength, muscle mass and recovery with training.” That seemed right up my alley and so I said yes. They sent me a 30-day supply, which sells for $60 on their site. Now quickly before I provide my review, let me just recap for those who might have missed it what I have been doing in my training. I workout 5-6 times per week. This always includes three CrossFit classes and one personal training session, which is heavily focused on brute strength and core work. I also have been regularly lifting at least once per week (back squats, bench press and deadlifts). Basically, I have been going heavy since the beginning or March and all this time using the HMB+ Creatine product. 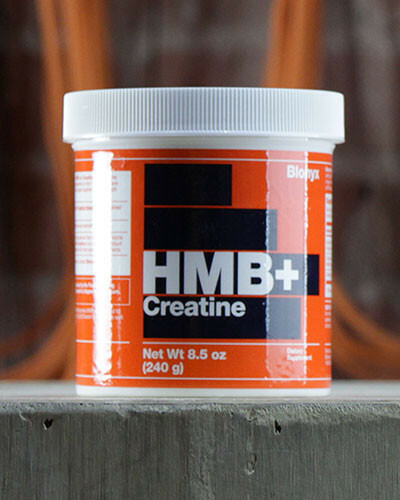 First thing first, the HMB+ Creatine comes in powder form and is intended to be taken twice a day. Since the product only consists of two ingredients, there is nothing to mask the fact that it doesn’t taste great. And Blonyx will tell you the same. There is no artificial flavoring, no added sugar, nothing in the least to hide the slightly chemical, metallic taste. But that really wasn’t that big of an issue after the first day or two when you are just starting to use it and are inherently more aware of it. I would either just mix it some water and quickly chug it or put it in my whey protein shake. I can deal with the taste as that is much preferred to it containing a bunch of added junk just to please the senses. It is also recommended to take it while having a meal. I always had it with my breakfast and my dinner and felt fine. Second, creatine alone usually causes some weight gain and this was absolutely true of my experience. The weight gain typically comes from a mix of water retention and increased muscle mass. In my case, I gained 6 pounds over the past month, going from 170 pounds to 176. (On a side note, this is from a low in early January of weighing in at 161 pounds). For me, it was a welcome surprise as I wanted to pack on some pounds this spring in anticipation of my upcoming competition in Fargo in June. The weight gain will probably level off or I might even lose a few pounds now that my month-long trial is over, but the net gain, especially the added muscle, is excellent. Besides the added pounds, the really other noticeable difference was how much it helped with recovery. While it is hard with all the variables to attribute the supplement to my success at certain lifts or new PRs I have had over the past 30 days, I can say with certainty that it definitely helped me recover more quickly with such an aggressive training schedule. My arms are typically so sore during and immediately after my personal training sessions due to heavy sets on the bench, weighted pull-ups, cleans and the like. But by the next day I would always feel good as new. I really experienced little soreness throughout the month-long trial of Blonyx and that made it a lot easier to get right back after it in the gym each day. The clear impact of Blonyx HMB+ Creatine is felt in comparison to not taking it. The effects – increased muscle gain and quicker recovery time – to date have been great. I am going to go the next month without using it to see and feel the difference. After that, I will be able to make a more sound decision in term of my overall training what role it will play. At the very least, I now realize it is not a supplement reserved for the elite. It has benefits for an athlete of any caliber or size.